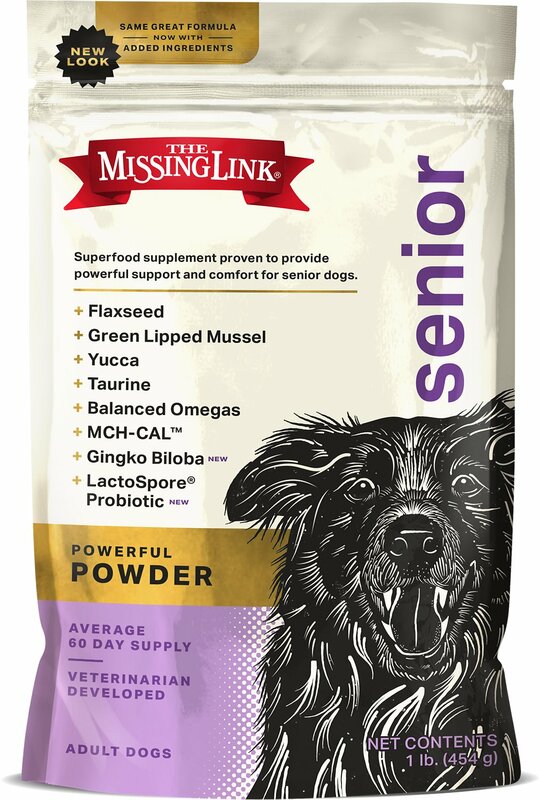 Show your aging pup that you still love him just as much as ever with The Missing Link Ultimate Canine Senior Health Formula Dog Supplement. This premium superfood supplement powder helps make sure your best friend receives the whole food nutrition that may be missing from his daily diet. 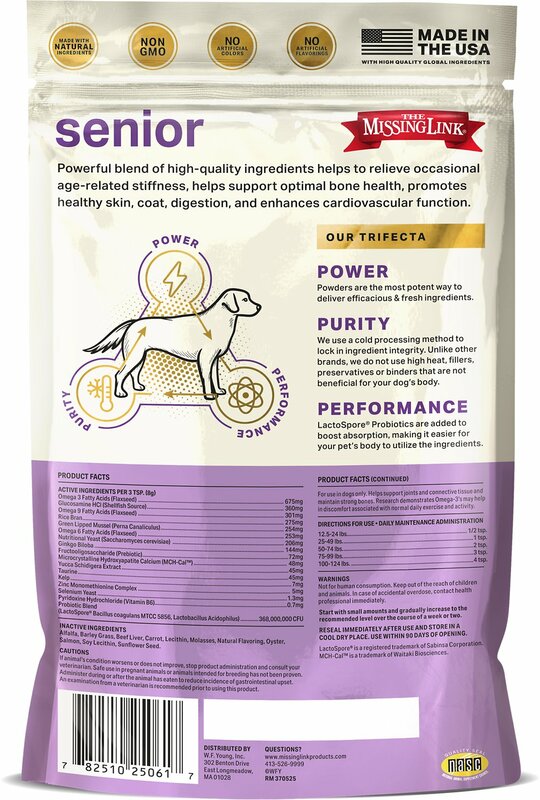 An exclusive blend of green lipped mussels, probiotics, glucosamine, phyto (plant) nutrients and fatty acids from omega-3 and 6 provide your senior canine companion with the nose-to-tail digestive health, pain relief and joint support he needs to live the happy, healthy life he deserves. Premium non-GMO superfood supplement powder targets the specific needs of your aging dog with his long-term well-being in mind. Helps make sure your best friend receives the whole food nutrition and vital nutrients that may be missing from his daily diet. Glucosamine and New Zealand green lipped mussels help maintain flexibility and support healthy joints. Omega-3 and 6 fatty acids promote cell health, absorb fat soluble vitamins, and maintain healthy energy levels. Probiotics and dietary fiber promote good digestive health, while essential phyto (plant) nutrients support his long-term health and nutrition. My German Shepherd just turned 10 years. She has arthritis and was hobbling. Missing Link has helped her quite a bit. I have used it before and liked the results. I have always had excellent luck with Missing Link and continue to trust it as my dogs become seniors. I have recently started making food for my extremely picky, nearly toothless senior chihuahua. I add this to her food to make sure she's getting all the vitamins and minerals she needs. I started giving my 10 year old foxhound this everyday for about a month. Within two weeks her eyes were more clear and uncloudy, her fur was brighter, and she has become more outgoing. This stuff works magic on the outside, I can only imagine how good it's doing her on the inside. Daydream says thank you. Really makes a difference in his walk & he’s able to jump up on couch & the bed. It’s just amazing how this helps. Been using it for years. After 2 weeks my 9 year old fur baby is playing like a puppy again! His fur is softer eyes brighter. He loves the taste. My eight year old shepherd mix was getting quite stiff and starting to limp a lot. I added this to her diet and after a month I no longer see signs of her arthritis. 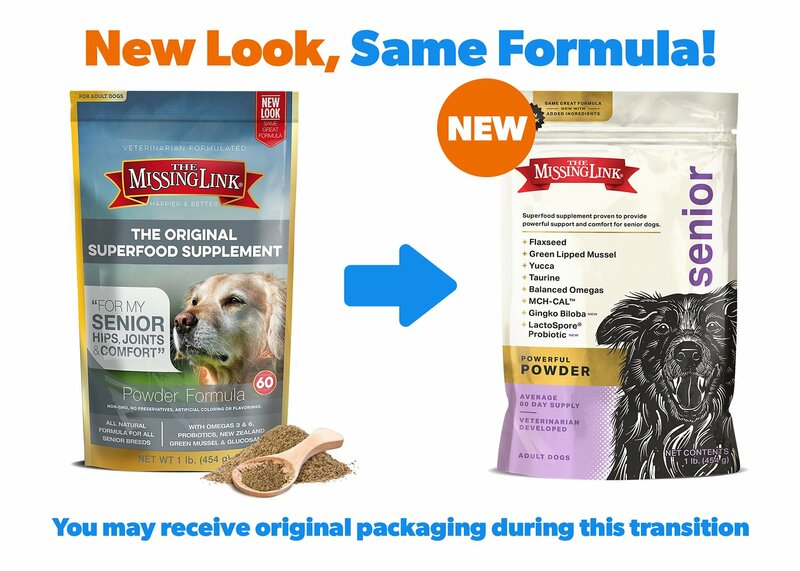 If you love your dogs and want them to feel their best, then give Missing Link a try. I’ve been using this product on my Chihuahuas for the last 2 years. I just now switched to the senior since they are 12 and 13. It makes a huge difference. They don’t experience joint pain! I am happy that they feel better. I highly recommend this product!! I have been using Missing links for all my dogs for several years. I purchased the Senior Health Formula for my 10 1/2 year old female Akita she does very well on it. I feed her twice a day always include missing links. Just put a scoop full on her food. After seeing news report that grain-free dog foods lacked taurine, which dogs need for heart health, was glad to find this for my 7 year old lab and it contains taurine in addition to all the other beneficial nutrients he needs.